Click on the links below for shortcuts to documents, videos and troubleshooting support. 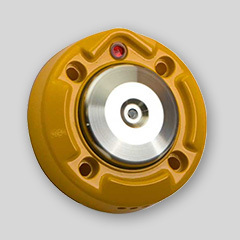 These same accessory and support materials are also available for each product in its product section. To Download the iOS Field Service App for an iOS Device, please visit the Apple App store and search for "Polara Field Service App". 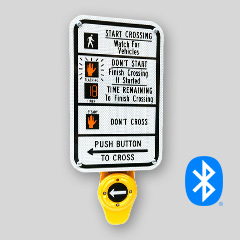 Polara is the leader in APS crosswalk systems benefitting the visually- and non-visually-impared alike. 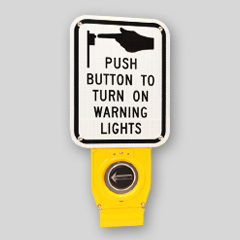 Polara's famous Bulldog push buttons are the most durable and reliable crosswalk buttons available. 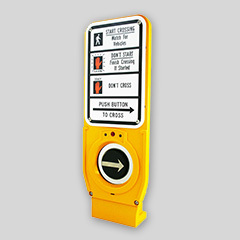 Polara's Model-X is the standard for pedestrian crosswalks with in-pavement or overhead flashing yellow lights. 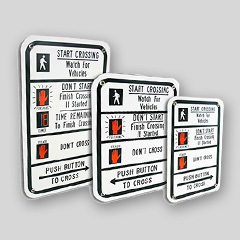 Polara produces crosswalk signs for the visually- and non-visually-impared.